In this episode of the podcast, we're learning about the foods of Passover from returning guest and Ithaca foodie Mark Anbinder of 14850 Dining. And the theme of Jewish food continues as we visit Hal's Deli in downtown Ithaca for the next stop on our review of every restaurant in Ithaca from A-Z. You can check out photos from our visit on our Flickr page (http://www.flickr.com/photos/eatingithaca/). We've also got some thoughts on Easter candy favorites, and you'll be surprised how much Andrea has to say about the Cadbury Creme Eggs of her childhood. If you like what we're doing here and would like to help us continue covering the Ithaca dining scene, please consider making a donation by clicking on the DONATE button on our main page. If you want to get in touch or be part of a future episode, you may leave a comment on the blog, call our voicemail line anytime at 607-215-4392, or send an email to: feedback [at] eatingithaca [dot] com. Remember to follow us on Twitter for continuing updates throughout the week! Ithaca Farmer's Market is now open! Drink about 1/3 of the 2-liter bottle (to allow headspace for ice expansion). Then reseal and put into a cooler at 27 degrees F for about four days. This will cause it to freeze very slowly, allowing the ice to preferably pick up the water. At the end of the four days, shake it a gently to free up the ice, and decant the concentrated result. If it's too strong, you can mix back in some of the icy slush. Note that if you don't open the bottle before chilling it to 27 degrees, it generally won't ice up, because of the dissolved CO2. 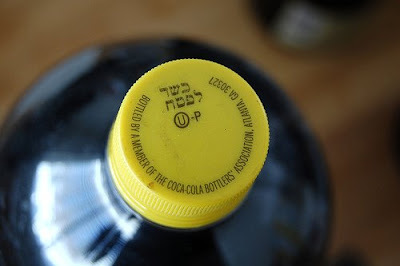 If you then open the bottle, a small amount of ice will spontaneously form in it, and you can enjoy a unique refreshment: colder-than-ice soda! Wow - I'm impressed with your laboratory approach on this! How did you come to 27 degrees so specifically? Do you think that really makes a difference? Thanks for the report - you just might be the Harold McGee of cola! Subscribe to EATING ITHACA News! Get updates on our latest posts and podcasts delivered free to your inbox the same day! We need your support to keep this podcast and website going. If you enjoy what we do, please consider making a donation by clicking the button above. Thank you! If you're interested in becoming a sponsor of our podcast, you can get details by sending an email to: dave [at] eatingithaca [dot] com. Click here to see the list in a new window, or click here to get a PDF of the list to print! Share your photos in our Flickr pool! This is a Flickr badge showing public photos and videos from EatingIthaca. Make your own badge here. It's a blog and podcast about local eating, including every restaurant in town from A-Z, plus interviews with the chefs, the farmers, the businesses, and anyone who make eating in Ithaca and the Finger Lakes so great!